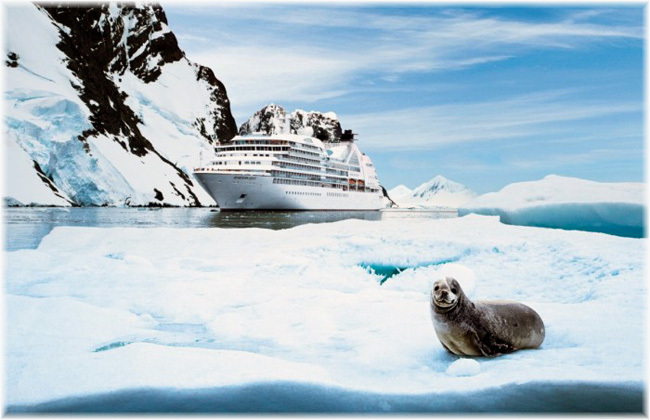 Seabourn, the world’s finest ultra-luxury cruise line, is launching new pre-cruise experiences taking guests to the South Pole on select Antarctica & Patagonia itineraries during the 2016-2017 season. Guests bound for the Great White Continent aboard Seabourn Quest can extend their adventure with two new travel packages that also travel to UNESCO World Heritage Sites, including: Polar Quest & Patagonia and Polar Quest, Tierra del Fuego & Iguazu Falls. Both of the pre-cruise packages include stays at Union Glacier Camp in the southern Ellsworth Mountains, one of a few private seasonally occupied camps in Antarctica. Operated by renowned land-based tour operator Antarctic Logistics and Expeditions (ALE), the full-service camp offers spacious, double-occupancy sleeping tents; freshly prepared gourmet cuisine; and a spectacular setting for activities from scenic excursions to technical climbs and ski tours. + Polar Quest & Patagonia (14 nights/15 days) – In addition to a transantarctic flight and landing at the South Pole, this overland journey takes guests on an exploration of breathtaking UNESCO World Heritage Site Torres del Paine National Park that encompasses 450,000 acres of forests, rivers, lakes and virgin pampas in southernmost Chile. Choose from a variety of included excursions providing daily opportunities to explore the various environments, including vivid blue ice pools, raw glacial moraines and abundant wildlife from guanacos to Andean condors. Package rates start at $50,999 per person based on double occupancy; pre-cruise departure December 4, 2016 followed by Seabourn Quest sailing December 19, 2016. + Polar Quest, Tierra del Fuego & Iguazu Falls (16 nights/17 days) – In addition to a transantarctic flight and landing at the South Pole, guests will join a select company of intrepid explorers en-route to one of the world’s most remote and unspoiled destinations: the breathtaking UNESCO World Heritage Site of Iguazu Falls National Park on the border of Brazil and Argentina. From Santiago, Chile to Buenos Aires, Argentina, guests will witness an immense complex of waterfalls. Explore the falls and its surroundings from extensive walkways or take options such as inflatable boats or helicopter tours. Package rates start at $53,999 per person based on double occupancy; pre-cruise departure December 26, 2016 followed by Seabourn Quest sailing January 12, 2017.